On Wednesday’s Mark Levin Show, Speaker Nancy Pelosi politicized the State of the Union address (SOTU) in her latest attack on President Trump by writing a letter requesting that Trump suspend the SOTU citing the shutdown as a pretext for diminished security. Despite the Department of Homeland Security and the Secret Service confirming that they are in fact ready and able to secure the President’s speech. This is another attempt to deny Trump of what any US President is expected to do. 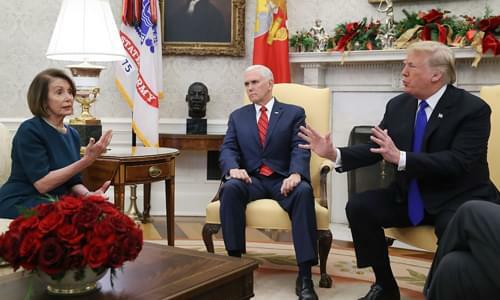 Trump should direct the President of the Senate and the Senate Majority Leader to make arrangements to deliver the address from the Senate chamber instead of from the House of Representatives, completely bypassing Pelosi. Trump should explain that Speaker of the House is politicizing his report to We The People. Trump should make it crystal clear in his address that House Democrats do not run the Executive Branch, just one portion of a bicameral congress. Then, if Pelosi continues to obstruct the President, GOP members of the house should move to expel her, even if they can’t get enough votes. The House of Representatives does not belong to Pelosi, the House leadership or the Democrats, it belongs to the people of the United States! Later, the media is nearly synonymous with philosophies of Marx and Hegel and this is symptomatic of what’s happening to our country today. The pursuit of a harmonious utopia. Finally, a radicalized Georgia man who had plans to attack the White House with an anti-tank rocket was arrested Wednesday.